Did you know that one out of three adults do not get the nutrients* they need? Now there’s a way to help fill your nutritional gaps. Think getting complete, balanced nutrition is boring? Think again. Try these great-tasting Ensure recipes or add Ensure to your own favourite dishes. From protein shakes to entire meals for the whole family, you'll never be bored with good nutrition again! OR - indulge with something refreshingly different! Try nutritious recipes from Ensure Clear™ and more mouthwatering recipes made with Ensure®. US readers - Jump-start your journey to better health. Here are a few perks to help you along the way. 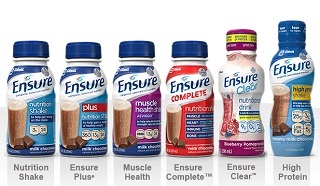 Sign Up and Save on any Ensure Product! Canadian readers - Join this FREE Club and benefit from countless tips and resources AND receive up to $50 IN DISCOUNT COUPONS and bonuses!